BEST (WORST) PICKUP LINES I"VE HEARD!! You will not want to miss this video! All the worst pick up lines I've heard while out related to my height! Watch till the end for the best one!! Watch My Awkward Airport Encounter Now! FIND OUT WHAT THE GIRL AT THE PUBLIX CUSTOMER SERVICE COUNTER SAID TO ME!!! Watch this video for a big announcement for #theshortgirldiaries!! So there's a lot of things that come with being short that nobody will tell you about. But unless you have a short fairy god mother following you telling you all the weird, awkward, and uncomfortable things you'll encounter, you probably won't know about it. There's a few weird things I've noticed over the years that people are oddly curious about. I'm going to tell you the top four questions you'll get as a short person that nobody warns you about. 1. Everyone is weirdly curious about your shoe size. I can't tell you the amount of times I get asked, sometimes daily, about how big my feet are. Women want to know my shoe size, and men want to put their foot up to mine and compare. Like, my feet match my body size. I don't get it? 2. Everyone assumes your metabolism is lighting fast and you can eat whatever you want and never work out, all because your short/tiny. Uh, no. I work out but I also I know when I need to cut back on the McDonalds. I can't eat WHATEVER I want, but I do choose to. (I should probably stop sometime, right?) And I workout. I'm a former college athlete so I actually enjoy working out, and I know my body well enough to know if that I still need to work out regardless of what I eat. 3. Everyone secretly wants to know how tall your entire family is. Like your entire family....your dad's mom's cousin's auntie. They're fascinated that you, a short tiny little thing, came from even MORE short tiny little things. Like, how do you think we got this way people!? 4. You will be asked to take some of the most awkward photos of your life. Sure. I've taken a lot of infamous photos with volleyball players and super tall basketball players, but I have random strangers ask me to take pictures with them somewhat often. Or my friends want me to take pictures next to really tall lamps or other things. I can't make this stuff up people. It's for real! What do you guys think? Has any of this stuff happened to you!? Let me know by clicking the "comments" button above! As always thanks for reading peeps. Stay tuned for more! You sit on your bags just to attempt to get them to zip, and pray they don't go over the 50lb mark at the desk. Your friend hears you struggling and walks in the room. He asks "For such a little person, how can you pack so much? Your clothes are baby doll size, you should have EXTRA room in there if anything...." My response: "Let me live my life!" The uber arrives to pick you up and notices your bag is more than half your size so he jumps out immediately to help. "No no no, I got it thank you so much." You don't need his help. But of course, he's got a tall SUV and you have to lift your (hopefully less than 50lb) suitcase into his trunk without banging it against the back of his car and leaving a mark.....unsuccessful. Whoops. But then you ALSO have to shut his trunk. Which you can't. Because you can't reach the handle at the top. Uhhhh....sir? A little help please. When you get to the airport he pulls up to drop you off and immediately hops out to grab your bags. Smart man. You walk into the airport and are immediately asked if you need help because you look like an unaccompanied minor traveling alone and nothing but helpless. Airport lady: "Hi honey, where are you flying to today?" Airport lady: "Okay miss and do you have your boarding pass?" You: "Yes I have it I just need to..."
Airport lady: "OH MY GOODNESS I just have to say you are so cute!! How old are you??" You: "23, I just have to check my bag...."
Airport lady: "No way! You're so tiny! I was thinking you're like 16 maybe! That's so cute." You: "Thank you. I've gotta check my bag now so I don't miss my flight." Airport lady: "Oh here honey let me do that for you." *Thinks to yourself* "I guess I still look helpless. Whatever lady, less work for me!" Well then, bag is checked and your ready to grab a drink and wait to board. You go and sit at whatever bar or restaurant is nearby. You sit down at the bar and immediately receive wide-eyed stares. You can tell everyones thoughts, "This little teenager (maybe) is sitting at the bar" ..... "Does she think she's gonna get served a drink?" ...... "I can't wait to watch her get rejected with her fake ID"
You order a Budlight and finish it with stares coming from all angles, pay your tab, and head to your gate. I mean who doesn't have ten people staring at them all while simply drinking a beer? Heading to your gate you see all types of different people. The family with 6 kids trying to figure out how to fit everything in their stroller to get on the plane. The business guys talking on their phones, and on their laptops, while trying to charge every device they have at the same time. The college students decked out in their school's gear thinking they're supercool. The family that's never traveled before and is already lined up for their flight that doesn't even board for another hour. All these people you're staring at wondering what their lives are about, and you wonder what they think of the little girl walking through the airport with her backpack sagging down to the back of her knees and huge purse on her arm all by herself. Lol. When you finally get to board you line up right by your number waiting your turn to get on. Of course, everyone stands right next to your or pretty much on top of you. They think you're with your mom aka the lady standing to your right, or that you're just simply lost and going to move soon because you look like a child standing by yourself. So you never get to board at your actual time. Ugh. The airline attendant greats you immediately stepping on the plane. Airline Attendant: "Hi there! You are too cute! Can I see your ticket?" Airline Attendant: "Okay sweetie you're in row ten, seat B, that's right before the exit row, and the middle seat!" Do I look like I can't read my plane ticket? Do I look too young to know how to put myself in a chair? Hmm. I may be competent enough to find my seat, but I know I can never reach the overhead compartment so I never bring a carry on, thank goodness. During the flight when the attendants ask you what you want to drink, you order an alcoholic beverage. She asks for your ID all the while the old man to your right is yelling, "Oh boy you don't look near old enough for that! How old are you sweetheart!?" The flight attendant takes your ID, accepts, gives you a smirk, and moves on. Thank god. The ride is pretty smooth, aside from the large man next to you who has his shoulder and entire arm in your seat. During turbulence you're jiggling all over the place because he's jiggling all over the place and is basically right on top of you. What a great bonding experience for you and this complete stranger! You finally land and can stand up and actually use your left arm. You wait your turn to get off the plane and can't run any faster to baggage to grab your luggage. When you see your family waiting for you at baggage, you know you've finally made it and have nothing left to deal with! So you could say traveling is always interesting with me. I always hear some sort of comment, get some sort of funny looks or can't reach something. I do have to say I love traveling and going new places, and I do love hearing what kind of comments I get in the new places I go! What's traveling like for you? Stressful? Fun? Let me know by leaving a comment below! I've got a new outfit for you guys next week so stay tuned! As always, thanks for reading peeps. So I know I talk about cheerleading a lot on my site but hey, it's my webstie so I can do whatever I want, right? So I wasn’t always so confident in my height. I wanted to be a Victoria’s Secret model – true statement – and I found out that wasn't going to be reality at a young age. I went through multiple tests and found out it was too late for me to start growth hormones (at the age of like 10) and that I was never even going to make it to 5 feet. Bummer. I wasn’t good at the sports that required a ball, I got teased a lot for my height, I didn’t want to ride horses anymore, and I just wasn’t okay with being 4’8” tall. But in cheerleading, I was the perfect size. From the start I was picked as a flyer, which is probably one of the most fun jobs on the team. You get thrown in the air, chucked into pyramids, and I was put in the front for most cheers and dances because nobody could see me otherwise. It was so exciting because cheerleading finally gave me a place where I felt like I fit in. As I got a bit older I liked the different aspects of cheer more and more. I found I really liked performing in front of a crowd. I loved entertaining people and seeing their reactions when I hit my stunts or did a really cool tumbling pass. My favorite part was interacting with the crowd at games and watching them get pumped up for the players. It gave me a lot more confidence in my every day life, even though I was totally self conscious about my height. 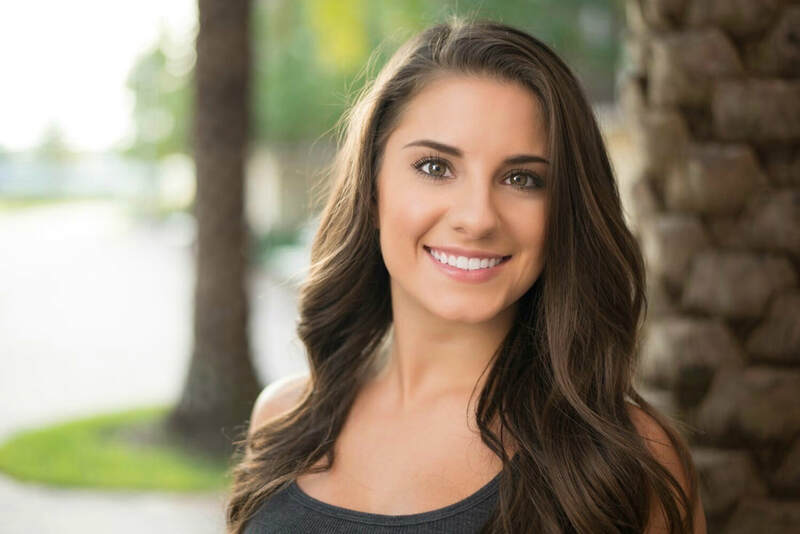 Cheer helped me overcome that anxiety and grow in my social skills. As the time went on I became obsessed with doing my hair and makeup for performances and games. I loved seeing which hair style was the best. Some hair styles I won’t even talk about because they’d be pretty embarrassing today (aka the pouf; what was I thinking!?). But I loved trying on new eyeshadows and picking the perfect color for my lips. I blushed when I got compliments on my makeup or how my hair looked that day. I began to help my teammates with their hair and makeup which was so much fun. I now had a new found love/obsession for everything beauty that has continued up until this very day, all thanks to cheer! When I got into college I met some of the most incredible people – they were all short. YES! All the girls on my college team were right around my height so I wasn’t the super midget anymore. Sure, I was still always the shortest one, but I didn’t stick out like a sore thumb in a group photo anymore. I could share clothes with these girls, and shoes, and just life experiences about being a tiny, petite girl! Some of my teammates have turned into my best friends that I’ll have for a lifetime. They’ve helped me feel more confident in myself, and in my own skin, and I have cheerleading to thank for bringing us together. 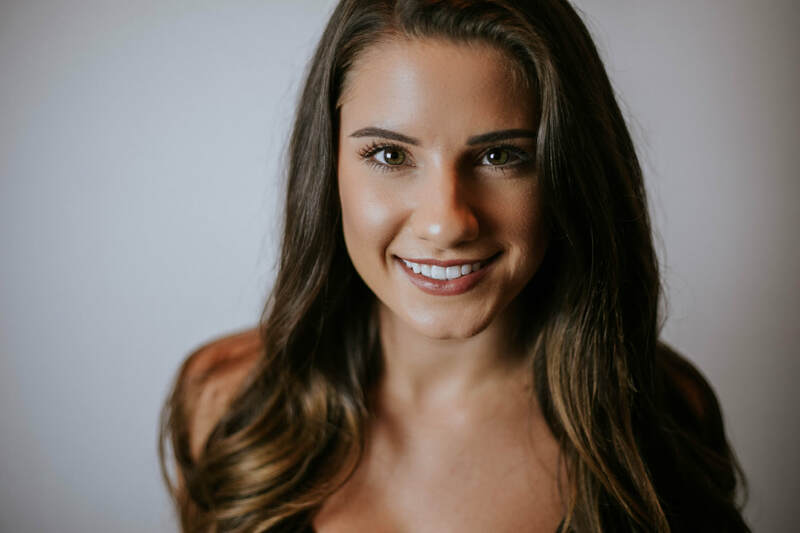 Cheerleading helped me find my place growing up, and bring out different characteristics I didn’t know I had, as well as some new obsessions. I wouldn’t trade my cheerleading career for the world. I’m so glad and lucky to have had these experiences, and that they have helped me get through the difficulties of growing up different. What are your thoughts or experiences? Did you play another sport that helped you fit in when you felt like you had the short end of the stick? Did you have a mentor or friend that helped you get through the hard times? Feel free to let me know by clicking the “comments” section of this post! As always thanks for reading peeps! Stay tuned for more. You don't get to choose your height. You can't grow or shrink on command. So you have to learn to love the inches you're given, whether there's a lot of them, or not so many of them. That's what I had to do. I can always wear heels. Always. And I'll never tower over anyone! Everyone pushes me to the front of a crowd because they feel bad. Whenever there's a speech or presentation, everyone will put me in front of them because they feel sorry for me that I can't see anything. Hey, front row view? I'm not complaining! I don't have to worry about being too tall for boys. Dating wise, you don't EVER have to worry about how tall a guy is. ​I can fit more clothes and shoes in a travel bag than anyone else. You think you can? Try me, I dare you. I'm bomb at hide and seek. I can fit in the best hiding spots, and never be found! I can walk under most obstacles. I never hit my head. I don't have to worry about ducking, or dodging ceilings and things. I'm always told I'm cute. I know I told you guys this can get annoying...and it can for sure. But I'd rather people tell me I'm cute all day then get no compliments at all! I can tell when everyone else has boogers. I'm always looking up at people and I know who's snotty and who's not. I see that as a special gift, really. Everyone thinks I'm younger than I really am. At the moment this may be a little annoying. But I know in years from now I'm gonna be saying HELL YEAH! Most of all, I love that I'm different. A lot of people have brown hair, and brown eyes. A lot of people have two sisters. A lot of people are cheerleaders. But not many people are 4'8" tall. I love having something that makes me unique and that nobody can take away from me. And that's my height! There are plenty more reasons why I love my height, but these are just a few for now! What are your favorite things about being short? Let me know by using the "comments" button at the top and leaving a comment! And stay tuned for next week when I talk about the best fashion tips for short girls! 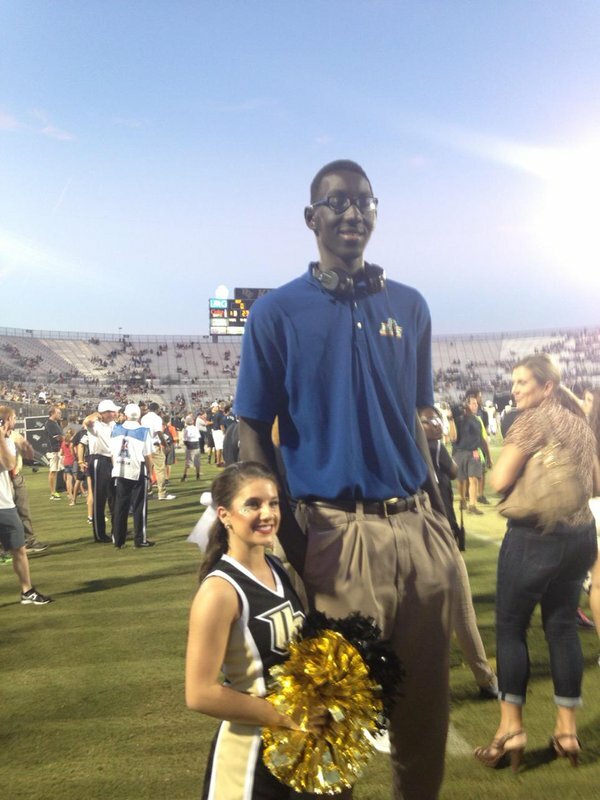 ​But anyways....I feel like I've received a lot of questions and comments asking me about what it was like meeting Tacko; recently and back when this photo was first taken. So I thought I'd write a short post to tell people my experience because I guess this is what people are interested in! Lol. I was waiting on the sidelines with my cheer team getting ready to cheer on my Knights Football team once again. My coach came over and grabbed my arm and said "Sammie, come here I need you!" Not much of a choice, so I obviously went along! She pulled me over to where some of the new UCF recruits were standing, waiting to be recognized by the fans. She said "Okay, stand here" (next to Tacko) while she proceeded to take a picture. And boom, another viral photo! I had to reach up to shake his hand as I introduced myself. He was very nice and polite while my coach made us both pose for a picture. You can imagine someone at his height, I'm sure he gets asked for photos all the time. So naturally I thought he would be a little annoyed, but he was so chill about it! J like I talked about before, when you stand out in a room full of people for some specific reason, you have to learn to embrace it or else, be miserable! So yay for Tacko for being so effing cool!! This photo once again reiterates the fact that athletes come in all shapes and sizes. We're good at a particular sport BECAUSE OF our build most times. I'm sure you wouldn't find Tacko flying through the air in a pyramid, and there's a pretty good chance you won't see me dunking in a basketball game anytime soon. But that's what makes all of this so awesome. People are different shapes, sizes, ethnicities, colors, and everything else for good reasons! That's why I love connecting with people. Everyone has their own, different experiences on the similar things! Just a short and sweet post for those people that have asked me! Stay tuned for next week when I talk about all the reasons why being short is AWESOME! So I feel like as a short person you have some of the most awkward encounters. People feel like they can touch you, pick you up, say things to you without thinking first that wouldn't happen if you were just a few inches (or feet) taller. It just gets weird sometimes! I've had a lot of funny/awkward/weird/uncomfortable encounters I want to share with everyone. Many years ago worked at Texas Roadhouse, shoutout to all my Roadies out there! But I was a hostess and working on a super busy Saturday night. "Johnson, party of 5! I can seat you"
I took the slip off the host stand and motioned for them to follow me. When I stepped down from the host stand, the mom's eyes lit up bigger than I've ever seen. "Ohhhhhh my god look guys someone smaller than me!!! Boys look!!" She made her husband and three sons, who were kinda cute, come and stare at me while she stood next to me to show them I was shorter than her. Meanwhile I'm holding their rolls and silverware in my hands just trying to do my job. Ugh. "Oh my gosh I've never met anyone shorter than me! My bos tease me all the time about how short I am! You're so cute!!" Okay, this lady was probably 5'4". Granted her husband and kids were tall, but to me if you're 5'4" you're not short in my book. Especially compared to me! So I just giggled and said thanks and tried once again to take them to their time. Let me remind you there's an entire restaurant full of people, and even more people in the waiting area watching this and angrily waiting to be seated. "Right this way I'll show to your......"
"Can I take a picture with you!?!" Oh. My. God. This is so embarrassing. Everyone in the host stand and waiting area is now watching me take a photo with this crazy lady because she thinks I'm short. Meanwhile my boss is wondering why I'm causing a scene and not doing my job. Awkward, embarrassing and every other related adjective. I was on a flight heading back to Orlando flying on Southwest. They have $5 beer, wine and liquor so I thought why not I'll get a drink. I ordered a jack and joke and the old grumpy man next to me says "Sweetheart are you old enough for that?" The flight attendant proceeded to ask for my ID afterwards and the people in front and other side were now staring at me, probably waiting to see if I'd get rejected or not. "Yes, I am actually. " I went shopping with one of my friends back in high school one weekend. We were in Charlotte Rousse, which was my jam back then. At this time, they also kept the cutest clothes on the top racks. Ugh. But, they also kept ladders in the stores at this time too. This particular store had one of those middle step stool ladders that went up three steps. There was a super cute top that I really wanted and my friend was in the back of the store. What'd I do? Yep, opened up the ladder, crawled to the last step, and grabbed my top. As soon as I got it I heard a "Excuse me, ma'am?" Oh no, busted. I turned around and said "I'm so sorry I just really wanted this top and it was at the top and I couldn't reach it!!" And I proceeded to crawl down the ladder as she was telling me it's store policy that customers cannot climb on the ladders and blah blah. But once my feet touched the ground, she looked way down at me and said "Oh, but I could see why you'd need it. You're so tiny!" Yep, that same saying I talked about in my last post that drives short people crazy! But hey, at least she understood. I'm convinced they took ladders out of stores and replaced them with the pole things because of short people like me! I'm in Victoria's Secret with my mom and sister, having a girls shopping day. I notice a young girl, no older than 10 staring at. This happens often to me, girls that age staring at me, I've decided because I'm their height so they think I should be there age. So it's totally fine. Whatever. But every time I pass her in the store I can tell she's looking over my head like "Woad we're the same height!!" She's taking a photo of me. Clearly.....in broad daylight too! (Ringer reference, you should watch it) But I'm just like whaatttttt areeee youuuu doinngggg!? I can see you're taking a photo of me, and yes we're roughly the same height. This is why I firmly believe children 10 and under should not have phones! You can see how things get a little awkward sometimes, right!? If you'd like to hear about even more awkward and uncomfortable encounters as a short girl let me know by clicking the "comments" button above! As always, check back every Wednesday for a brand new #theshortgirldiaries!